Home Known Issues Search SharePoint SharePoint 2013 SharePoint 2013 Error: Unexpected response from server. The status code of response is '500'. The status text of response is 'System.ServiceModel.ServiceActivationException'. 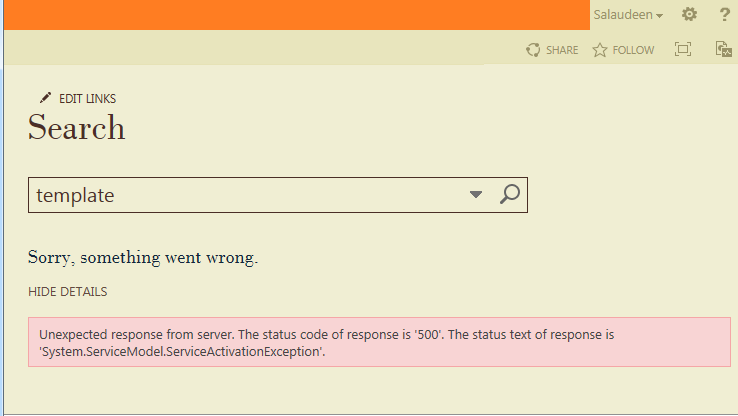 SharePoint 2013 Error: Unexpected response from server. The status code of response is '500'. 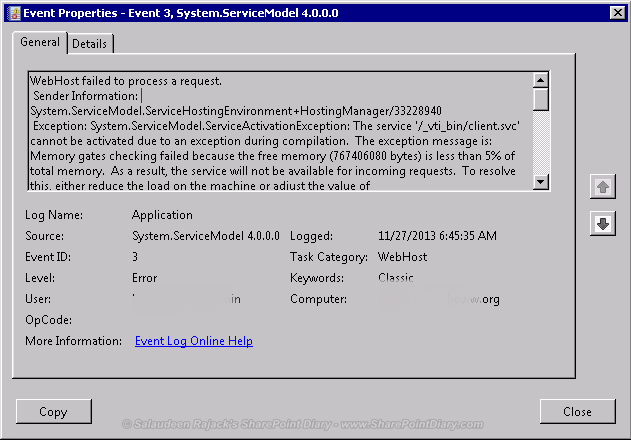 The status text of response is 'System.ServiceModel.ServiceActivationException'. Unexpected response from server. The status code of response is '500'. The status text of response is 'System.ServiceModel.ServiceActivationException'. Either increase the Server Memory or Try closing some running applications in the SharePoint WFEs to freed up the memory in server! Open the configuration file at "C\Program Files\Microsoft Office Servers\15.0\Search\Runtime\1.0\noderunner.exe.config" Locate the node "nodeRunnerSettings" and set the value for "memoryLimitMegabytes" attribute (Say: 100). By default its value is 0 (which means unlimited). Once done, restart SharePoint Search Host Controller process. Do not limit node runner memory in Production Servers!